The 16 Days of Activism against Gender-Based Violence is a global campaign which runs annually from November 25th (the International Day for the Elimination of Violence against Women) to 10 December (Human Rights Day). We invite you to join us for our fifth annual global tweetchat relay to mark the 16 Days of Activism (#16days). The topic this year will be Ending Gender-Based Violence in the World of Work. The tweetchat will take place November 29 from 8:00am to 4:00pm. Join development and health experts and justice and community activists for a day of conversation on the issues surrounding gender-based violence in the world of work and promising approaches to respond. The tweetchat will cover a wide range of topics including evidence-based approaches to end violence against women, the intersection of economic empowerment and violence, engaging men and boys to prevent violence against women and girls, and responding to violence against girls, among other important topics. 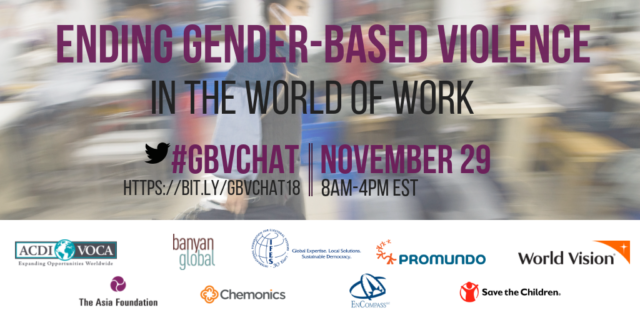 Follow the hashtag #GBVchat to join the conversation.